There’s been a shift in the culture at the counter of U.S. fast food restaurants. To compete with fast casual restaurants — such as Firehouse Subs, Chipotle and Smash Burger — fast food joints across the country are upgrading their atmosphere with warmer, more welcoming remodels. For the past two to three years, major fast food chains have been spending significantly less on opening new stores and reinvesting that revenue in remodeling their existing restaurants, said Darren Tristano, executive vice president of food industry analysis group Technomic. Tristano said fast food restaurants usually see a 6 percent to 8 percent growth in sales traffic after remodeling. Those remodels can cost on average between $100,000 and $1 million, sometimes subsidized for the franchisee by the parent company to promote unity across the chain. Bobby Haq, area supervisor for local McDonald’s franchise Griggs Enterprise, said business has increased about 30 percent at the McDonald’s on Mansfield Road since its remodel was completed in January. He said the remodel helped change the store’s reputation and made people more comfortable inside. That restaurant is equipped with new floors, modern furniture, free Wi-Fi and televisions. Haq said it gives the store a café feel, something that fits the company’s new climate encouraging customers to sit down, pull out a laptop and enjoy a coffee drink. Haq was a company man until he left McDonald’s in 1995. He returned to work for Griggs Enterprise in 2010. Limited service restaurant sales, which includes fast casual and fast food restaurants, come to about $200 billion per year in the United States, Tristano said. Fast casual sales represent about $27 billion of that. But fast casual restaurant sales are growing at a rate between 8 percent and 10 percent a year, Tristano said. Fast food sales, by comparison, are only growing at a rate of 3 percent a year. But in a tough economy, people are trading down on many of their usual services — including where they eat. Fast food joints are trying to capture that, Tristano said, by emulating fast casual restaurants in terms of dining experience. Higher-quality menu items and a comfortable atmosphere help bridge that gap without higher customer costs. 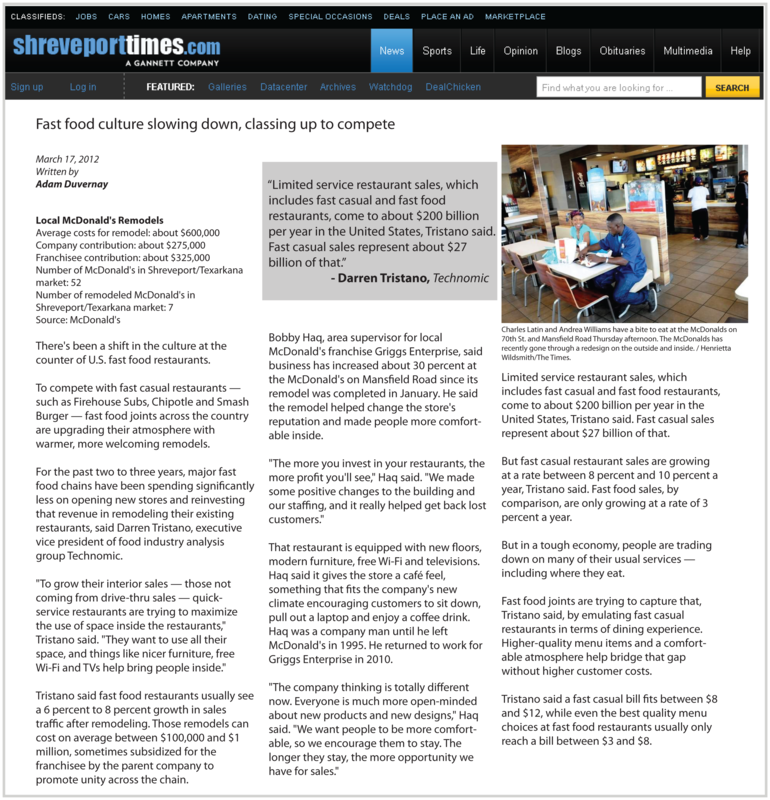 Tristano said a fast casual bill fits between $8 and $12, while even the best quality menu choices at fast food restaurants usually only reach a bill between $3 and $8. This entry was posted on Tuesday, April 10th, 2012 at 8:00 am and is filed under Burger, Expansion Strategy, Food, Foodservice Industry, Future Plans/Announcements, Growth, Marketing Initiatives, Price, Quick Service, Uncategorized. You can follow any responses to this entry through the RSS 2.0 feed. You can leave a response, or trackback from your own site.